• A tucked tail worked as a detector of tail damage in finishing pigs. • Tail posture seemed promising as an early detector of tail biting in finishing pigs. • Tail posture was affected by risk factors of tail damage. The purpose of the current study was to investigate the relation between the tail posture of finishing pigs and tail damage with the aims to use tail posture as (1) a detector of tail damage, (2) an early detector of tail biting to possibly predict and prevent bleeding tail damage. Tails of each individual pig (from 112 finishing pigpens) were scored three times per week for the full study period of 10 weeks. For the first aim, tail posture was observed directly in the stable three times per week, just prior to tail scoring, and pigs with a tucked tail were related to their tail scoring. The odds of being scored with a tail wound (both bleeding and non-bleeding) increased by almost sixfold if the pig was also observed with a tucked tail on the same day. More precisely, 28% of the pigs with a tucked tail were also scored with a tail wound, whereas this was only the case for 5% of the pigs with a different tail posture. This relation between a tucked tail and tail damage was larger than previously found in weaners and suggests that a tucked tail could be used as a detector of tail damage, although with the risk of many false identifications of tail damage. For the second aim, tail posture was observed from video the last 3 days prior to bleeding tail damage for case pens (n = 20; at least one pig with a bleeding tail wound) and their matched controls (n = 20). The number of pigs with lowered tails (below the tail root) was observed by scan sampling during 6 h per day. A generally higher probability of having a lowered tail was seen in the case pens compared to the control pens, but the probability of having a lowered tail did not increase prior to bleeding tail damage. Thus, the results indicate that tail posture is a promising early detector of tail biting in finishing pigs, but observations going further back than 3 days from bleeding tail damage are needed to find out when the difference in tail posture arises. Alternatively, a less severe definition of tail damage could be used. Further, the differences found were relatively small, and thus to be able to predict pens in future risk of tail damage from changes in tail posture would probably demand the development of an automatic recording method for the number of lowered tails at pen level. This document describes a screening method to assess if pigs are supplied with a sufficient amount of straw to fulfil their need for exploration and manipulation through collection of data on the availability of straw, pigs’ exploratory behaviour and lesion scoring. 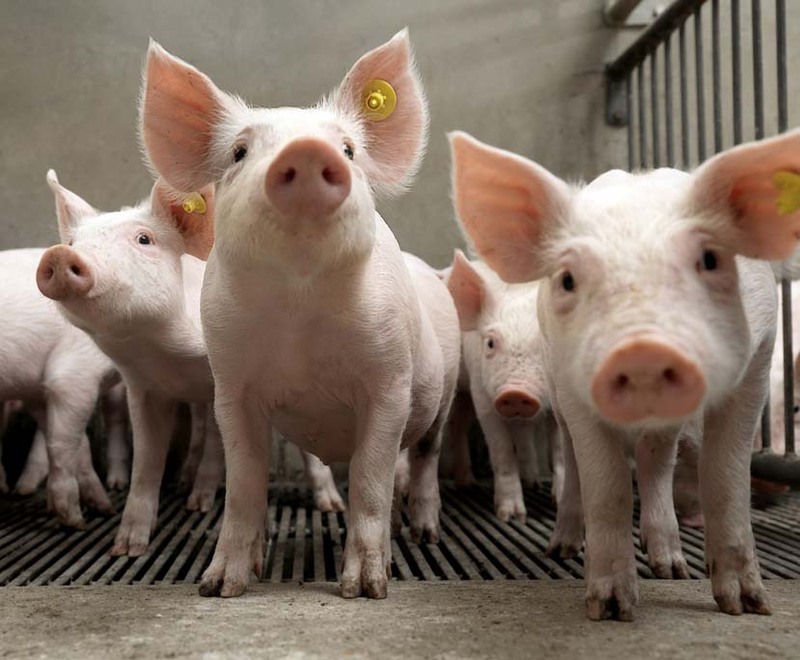 The tendency to reduce crude protein (CP) levels in pig diets to increase protein efficiency may increase the occurrence of damaging behaviours such as ear and tail biting, particularly for pigs kept under suboptimal health conditions. We studied, in a 2×2×2 factorial design, 576 tail-docked growing-finishing entire male pigs in 64 pens, subjected to low (LSC) vs. high sanitary conditions (HSC), and fed a normal CP (NP) vs. a low CP diet (LP, 80% of NP) ad libitum, with a basal amino acid (AA) profile or supplemented AA profile with extra threonine, tryptophan and methionine. The HSC pigs were vaccinated in the first nine weeks of life and received antibiotics at arrival at experimental farm at ten weeks, after which they were kept in a disinfected part of the farm with a strict hygiene protocol. The LSC pigs were kept on the same farm in non-disinfected pens to which manure from another pig farm was introduced fortnightly. At 15, 18, and 24 weeks of age, prevalence of tail and ear damage and of tail and ear wounds was scored. At 20 and 23 weeks of age, frequencies of biting behaviour and aggression were scored for 10×10 min per pen per week. The prevalence of ear damage during the finisher phase (47 vs. 32% of pigs, P < 0.0001) and the frequency of ear biting (1.3 vs. 1.2 times per hour, P = 0.03) were increased in LSC compared with HSC pigs. This effect on ear biting was diet dependent, however, the supplemented AA profile reduced ear biting only in LSC pigs by 18% (SC × AA profile, P < 0.01). The prevalence of tail wounds was lower for pigs in LSC (13 ± 0.02) than for pigs in HSC (0.22 ± 0.03) in the grower phase (P < 0.007). 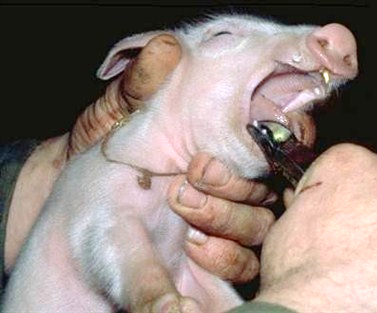 Regardless of AA profile or sanitary status, LP pigs showed more ear biting (+20%, P < 0.05), tail biting (+25%, P < 0.10), belly nosing (+152%, P < 0.01), other oral manipulation directed at pen mates (+13%, P < 0.05), and aggression (+30%, P < 0.01) than NP pigs, with no effect on ear or tail damage. In conclusion, both low sanitary conditions and a reduction of dietary protein increase the occurrence of damaging behaviours in pigs and therefore may negatively impact pig welfare. Attention should be paid to the impact of dietary nutrient composition on pig behaviour and welfare, particularly when pigs are kept under suboptimal (sanitary) conditions. Despite a long history of debate about negative affective states in animals, it was only in the last decades of the 20th century that the state of pain was mentioned in definitions of animal welfare, included in veterinary education, and became a target of scientific interest. Pain is a perceptional phenomenon built from information gathered by specialized sensory receptors for tissue damage and integrated into a discrete experience with a negative emotional valence in the brain. Based on knowledge about porcine neuroanatomy, physiology, and studies focusing on pig behavior and pathology, we review evidence for causes of pain in pigs, underlying biological mechanisms, as well as the possibility to quantify different types of indicators of pain states relevant to the welfare of the animals under production conditions. The presentation will primarily focus on pigs because of the dual purpose of this species as a meat producing as well as research animal species (the latter driven by the anatomical and physiological homologies with humans), making pigs unique among livestock. We will present methodologies and results from current research projects across Europe and North America targeting typical industry-related injuries (e.g., tail docking, lameness, and shoulder lesions) and aiming to understand the welfare consequences for the pigs. Throughout the talk, the emphasis will be put on future opportunities to link research outcomes with industry initiatives toward the improvement of animal welfare and production. In addition, possible future research efforts to help face current methodological limitations and favor a more comprehensive evaluation of animal pain as an overall experience will be discussed. This seeks to facilitate common future targeted research and enable us to overcome the paradoxical low level of knowledge about porcine pain and its alleviation under production conditions.